The last years of general economic difficulty across the EU and beyond, has prompted many guys like me to move and look for opportunities to work outside of their homeland. With the help of Cupid and my backpack, I left my beloved Spain. I moved to Italy and started working as a clerk for a shipping company. Since I’ve been in contact with the reality of the country, I’ve had the opportunity to delight my taste buds with some real delicacies and I have learned that flavors are important and that to eat is a sort of art. However, occasionally I found my Andalucia in a totally unexpected surprise package sent by my mom. That little envelope contained all the essence I was looking for: taste of Pata Negra! I allowed my Italian friends to try “my little treasure”, and they liked it. I had no doubts because I knew that Italians are usually big fans of natural products. 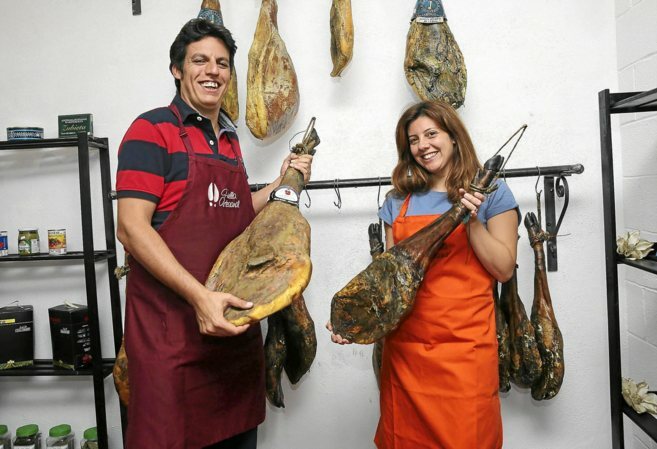 In fact, many of them already knew the Iberian ham. They thanked me and with excitement for the intense flavor of the ham, they confessed that they would like to try other types of products such as, the Iberian Spanish Chorizo ? ?and cheese. I then thought I could take this business of exporting typical Andalucian (the area I come from) products further. I had to consider the export of wine, one of the most renowned products of Sierra de Malaga, which is the mountainous area of Malaga, a province consisting of 66 municipalities in five circumscribed areas of production: Axarquía, Montes, Norte, Costa Occidental and Serranía de Ronda. The choice of the name of the company fell on Huella Artesanal because I wanted to focus the choice of exported products to the local craft businesses, which genuinely, follow the care and the aging of each product. My research has turned toward the small producers that ensure authenticity because now it’s difficult to find it in mass production, even if it’s well monitored by the big distributors. Huella Artesanal is also a dedication to the Spanish artisans, who with patience and love, used to breed animals in the wild. After several months of rich nutrition, they wait for the right slaughter age and they have handed down from father to son work for the sole purpose of having a great product. When finally the Pata Negra ham arrives on our tables we will have a single piece, with its forms and natural features and without any alteration. In short, we don’t like hams with the mold!